Captain Bush began his naval career in 1952 following graduation from the University of Michigan with a B.A. in Political Science. During the next several years he served in both the Atlantic and Pacific fleets on cruisers and destroyers. In 1956 he was selected for duty in submarines. In 1960 during the Cold War he attended nuclear power training and spent the next ten years at sea on nuclear submarines. 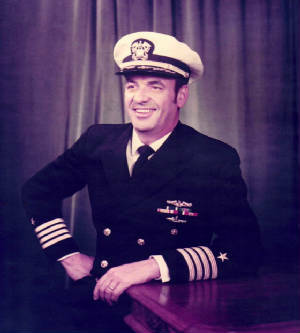 In that period, he was Executive Officer of the USS TRITON and the USS JOHN C. CALHOUN Gold, and, for three years, he was Captain of the USS SIMON BOLIVAR which was armed with Polaris nuclear missiles. Captain Bush next served in London, England, as a planning officer on the staff of the Commander in Chief U.S. Naval Forces Europe. During this time he earned a Masters Degree in International Relations from the University of Southern California. His next duty was in the Pentagon as Director of Readiness and Tactics for attack nuclear submarines on the staff of the Chief of Naval Operations. His last tour of duty was as the Operations and Readiness Officer on the staff of Commander of the United States Second Fleet and the NATO Strike Fleet Atlantic. He retired from the Navy in 1977 after twenty-six years of service – nineteen of which were at sea. After retirement from the Navy, Captain Bush served on three congressional staffs as military advisor. He joined the Center for Defense Information in 1982 and was appointed Associate Director in 1983. Because of his diverse military, academic, and political experience, he had established a reputation for expertise on a wide variety of military and arms control issues. He made presentations at significant academic and social institutions in the United States and abroad, having traveled extensively in Europe and Asia. Captain Bush retired from the Center for Defense Information in 1994. He served as a military advisor to Business Leaders for Sensible Priorities. He published numerous articles primarily on defense subjects in publications that include the New York Times, the Los Angeles Times, Business Week, Navy Times, and Defense News. He was the President of the Naples Council on World Affairs, Naples FL where he also was a group leader in the Great Decisions organization. He was a member of the Inter-American Dialogue and the Atlantic Council in Washington, D.C. He is survived by his wife, Patricia, of Naples Florida. They have two children and two grandchildren. “Mary Ellen and I spent yesterday afternoon at the Arlington Cemetery Memorial Service for CAPT. James Ter Bush, USN Ret. His remains were placed in a casket on a caisson drawn by 4 white horses, and led by another officer on horseback. A marching Navy Band and a squad of Sailors led the caisson to the burial site, where family and friends (probably 30 or more) were in attendance. We sang the Navy Hymn, followed by a three gun salute, and TAPS. The flag, held by the honor guard over Jim’s remains, was folded and given to Mrs. Bush at the completion of the ceremony by a Captain of equal or superior rank to Jim. A most moving ceremony, for a very impressive man. Jim Bush, an exceptional Naval Officer, a leader, a thinker unwilling to accept the conventional wisdom, a paradigm of patriotism. He was dedicated to service, committed to his country, willing to take risks, and always committed to truth, honor, concern for the disadvantaged, and the support of peace over war.